The Arab world’s relations with Iran are not uniform and neither is the media coverage. Iran has both its allies and its enemies in the Arab media and below is an overview of the news reports on the election. I’ll break it down by those supporting Ahmadinejad’s victory as legitimate and those contesting the legitimacy (to varying degrees) of the election results. Al-Sharq al-Awsat: The Saudi-owned London-based paper is framing the election as a full-on “battle” between Ahmadinejad and Mousavi. The paper legitimizes the Opposition by referring to the protests as “demonstrations” as opposed to the “riots” label used in other papers. The paper goes further to label Mousavi’s supporters as the “Reformist Opposition.” In an unparalleled move, the paper is publishing photos of Iranian security forces in civilian clothes harassing demonstrators. (This has wider implications because many Arab readers will draw a direct parallel between the undercover security forces in their own country.) I won’t simplify the paper’s editorial decisions as an indicator of its willingness to tow the Saudi line, but their coverage clearly pushes in favor of a new Iranian regime. Al-Quds al-Arabi: The Arab world’s token recalcitrant newspaper is clearly in favor of “reform” in the Iranian government. Just like al-Sharq al-Awsat, the election is not just an election — it is a struggle between the reformers and the hard-liners. Al-Jazeera: Any time there are street demonstrations of a political nature, regardless of the country, al-Jazeera will be there. The top breaking news on al-Jazeera’s site is that two Mousavi supporters were killed by “militants’ bullets” and articles begin by describing the massive crowds that have gathered to support Mousavi. Their coverage is comprehensive and puts CNN to shame. On top of their coverage, the channel is monitoring Western media coverage of the elections, allowing the viewer/reader to put events into context and not be overwhelmed by the constant stream of raw information. Al-Manar: I suspected that Hezbullah’s satellite channel would be lauding the election results after its secretary general Nasrallah sent a congratulatory letter to Ahmadinejad, but Hezbullah’s loyalties are to Khameini and since Khameini has called for the review of election complaints, the channel is regurgitating his official statements. Al-Manar refers to the protesters as “demonstrators” and is providing ungarnished information about the elections. If anything, the channel is taking direct statements from Iranian officials, re-wording them, and adding in up-to-date information. Overall, the channel is downplaying the reactions on the Iranian street and will be supportive of any official government conclusions on the integrity of the vote. State Media in Syria: Even though the most important story today in the Syrian press is President Assad’s trip to Armenia, I’m going to make a very general statement that is supported by my quick read-through of the Syrian state-media (al-Baath, al-Thawra, and al-Tishreen) and say that they support an Ahmadinejad victory and don’t want to agitate relations with Ahmadinejad in any way. 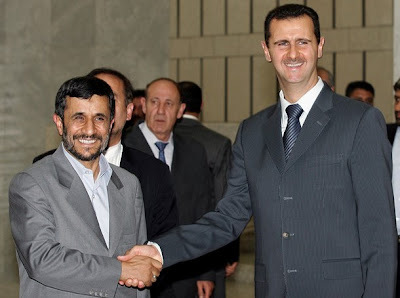 The public face of the strong Syrian-Iranian ties has been strategic buddy shots of Assad and Ahmadinejad. To even begin to suggest that the Iranian public might have been electorally swindled is a big no-no. Also, the state media is treading lightly around the issue considering that the Iranians have a real Opposition which is contesting election results openly and demonstrating in the streets. The Syrian press seeks to delegitimize the Opposition at any cost and refers to them as “rioters” and claims that the Iranian police have arrested individuals who sought to “incite violence.” A true depiction of the Iranian security forces roughing up innocent protesters and silencing dissent would ring too many bells at home. I expected slightly different coverage from the only private newspaper in Syria, al-Watan, but was dissapointed. The paper is private only in name, but its reporters are given more leeway in reporting foreign affairs. I suppose Iran is not foreign enough. The paper had a mere two articles on the election and didn’t stray far from the official line. You are currently viewing the archives for June, 2009 at the news in arabic.